On Monday, August 21, the shadow of the Moon will pass over Canada. The event is a solar eclipse. 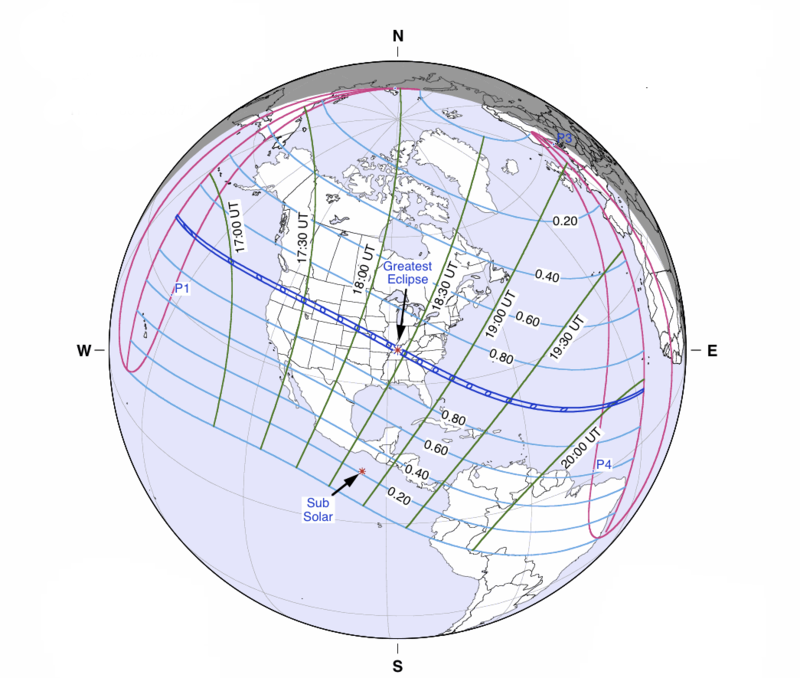 Along a rather long but narrow path which stretches across the continental United States from Oregon to South Carolina, people will see a total solar eclipse. Across all of Canada, we will see the Moon cover up a portion of the Sun – a partial eclipse. WARNING- never look at the Sun without proper protection. Use properly made solar viewers such as the ones for sale on the RASC estore. These filters are safe to look through with your eyes only (not to be used with other optical devices such as binoculars or telescopes – just your eyes. See our eye safety page for more information on filters. Members of the Royal Astronomical Society of Canada plan to set up telescopes on eclipse day to show the various phases of the partial eclipse through telescopes equipped with filters to allow safe viewing. Be sure to check the centre’s web site the day of the eclipse to see if it is a GO or NO GO. Please note: in case of cloudy weather, the eclipse cannot be seen. 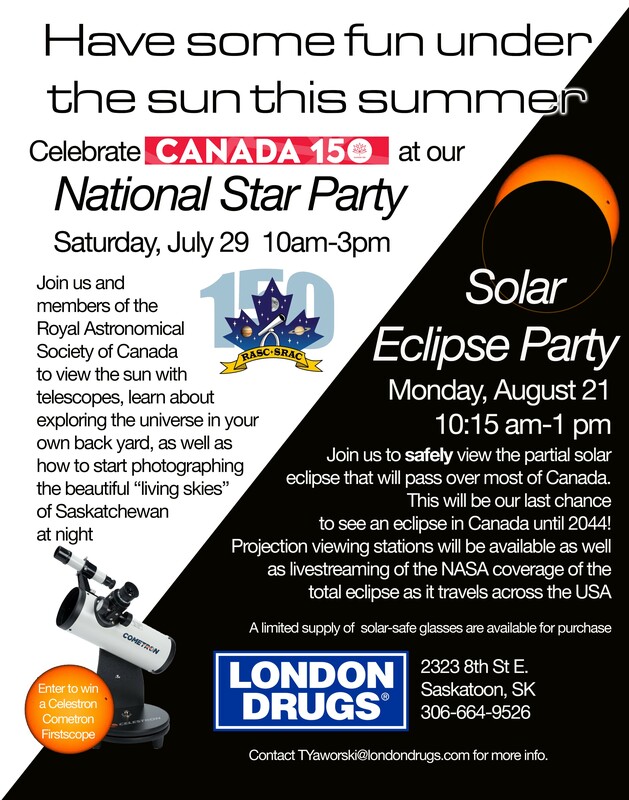 TELUS Spark is throwing an eclipse party. From 10 a.m. to 1 p.m., you can make your own eclipse viewer. From 10 a.m. to 2 p.m. enjoy a safe look through telescopes with solar filters. And there will even be a barbecue (for a price) from 11 a.m. to 1 p.m. The University of Calgary will have a solar eclipse viewing from 10:00 a.m. to 12:30 p.m. in a pop-up observatory in the courtyard on the south side of the Engineering Complex (Area 20) near the Taylor Institute. U of C will also have a remote viewing of the total eclipse as it unfolds across the Continental United States via the internet, indoors, in Engineering Building A, Room 101. For the solar eclipse Kingston Centre will be cooperating with Royal Military College and Queen's University to have several white light and H-alpha telescopes in Confederation Park on Kingston's glorious waterfront across from City Hall from 1 to 4 p.m. for public solar observing of the partial eclipse. This is a major tourist hub in Kingston and we expect an excellent turnout. Enjoy the eclipse at McGill University. There wil be solar telescopes set up, as well as free eclipse glasses and a live stream of the total eclipse. The event runs from 1 p.m. to 4 p.m. There will also be a viewing party at Espace pour la vie where there's free admission to the Rio Tinto Alcan Planetarium. The Saint John Astronomy Club is providing two locations to view the eclipse, which begins at 2:37 p.m. Head out to Irving Nature Park and the Rockwood Park Bark Park. Riverview -- Community Hall, 145 Lakeside Drive. Eclipse! On Monday August 21, 2017, the Moon will pass between the Earth and the Sun, treating the National Capital Region to a partial solar eclipse. This is a rare natural phenomenon and, with help from members of the Royal Astronomical Society of Canada, you can safely witness this event through solar-scopes and Sun-viewers. Meet these passionate astronomical experts and astrophysicist Jesse Rogerson to learn more about the physics of the solar system. Construct your own pinhole camera, which you can then use to observe the Sun. Telescopes will be set up from noon to 4 p.m., with the eclipse itself occurring from 1:17-3:48 p.m. The eclipse begins at 10:30 a.m. with 75 per cent of the sun covered by the moon at 11:46 a.m. At the Saskatchewan Science Centre, you can enjoy the spectacle with astronomers outside the Kramer IMAX Theatre. Mark your calendars! On August 21, 2017, the moon will pass in front of the Sun, giving us the rare opportunity to witness a partial solar eclipse. Join U of T astronomers as we view this spectacle from the fair grounds of the Canadian National Exhibition during the Ex. We'll have eclipse viewing glasses and telescopes for safe eclipse viewing, games and more! Plus, there will be plenty of U of T astronomers to answer all your questions. Stay tuned, we'll provide more details closer to the event! Vancouver Centre will be celebrating the August Eclipse at Science World, 1455 Quebec Street, Vancouver from 9 am to 12 noon. RASC Vancouver will have solar telescopes and eclipse shades to view the partial Eclipse. There is a fee for parking. Science World is easily accessible via transit and is adjacent to the Main Street Skytrain Station. University of Victoria Observatory – UVic is hosting a special public open house at the UVic Observatory (Bob Wright Building – 5th floor) on Monday, August 21, 2017 from 9 to 11:30 a.m. to view the solar eclipse. The eclipse will be visible at 90% coverage from Victoria. The eclipse begins at 9:08 a.m., reaches maximum coverage at 10:20 a.m., and will end at 11:38 a.m.. We will have eclipse glasses for the public to use and share, as well as special solar telescopes which will project an image of the Sun on a small white screen (attached to the telescope) to clearly show the eclipse. Looking at the Sun directly, even during maximum coverage, is damaging to your eyes. We request the public to leave the eclipse glasses behind after use. The event is free and no preregistration is necessary. The observatory will be open for the duration, and you are welcome to come and go as you wish. Please contact the Physics & Astronomy main office at 250-721-7700 if you need any further information. Please note, pay parking is in effect on the University campus. The Bob Wright Building is easily accessible by bus. Visit our facebook page for details. Eclipse times, percentages source: The Observer’s Handbook 2017 – The Royal Astronomical Society of Canada.